The 4th of July is always a time for celebration and relaxation. Whether you choose the low key family back yard barbecues, or getting rowdy with friends and fireworks, it’s a time to kick back and break from the daily drag. For me, this past 4th was particularly important due to it being my first time celebrating in Montana, and also because a good friend and his brother came to visit me from Texas. Both of them being first timers to the area and hungry for a memorable adventure. With this in mind and some advice from Will here at Explore, a trip was planned and action was taken early on the morning of the 3rd to fulfill just that. We set out on the first leg of our trip from Bozeman to Ennis, a short and beautiful drive that gives any newcomer to the area a glimpse of Montana’s rolling hills and wide open farmland. Upon arriving in Ennis, which was particularly crowded due to the holiday, we stopped at Pic a’ Nic sandwich shop to grab a quick bite before we made the next haul of the journey. Ennis has a quite a few eateries and cowboy esque bars that offer a cool flavor of the town if you are just passing through. It also helps that Ennis provides the last grocery stop to fill your cooler with beer before your final camping or fishing destination in the area. From Ennis, we headed south on 287 towards Cliff and Wade lake. Also popular destinations on the 4th, Cliff and Wade are glacial lakes that stay turquoise in color and frigid in temperature year round. Despite the water temperature and the splashing of 6 year olds with pool noodles, we took a much needed dip at Cliff to cool down from the 95 degree dry heat that seemed to be doubling inside our all black Kia sedan. The next stretch took us back to 287 and southwest into Idaho before arriving at the banks of Henry’s lake, a large attraction for those right outside the town of Mack’s Inn in Idaho. Wrapping around the banks of Henry’s lake, the road turns to gravel as you make a bend back north towards Montana. Getting close to the continental divide, the landscape in this area is beyond gorgeous. With the Centennial Mountain range to your left and atv trails and winding streams to your right, this desolate road is truly an escape from the outside world. South Valley road continues west for another 10 miles, a slow and easy drive through large horse filled pastures, before veering right towards Elk Lake Road. 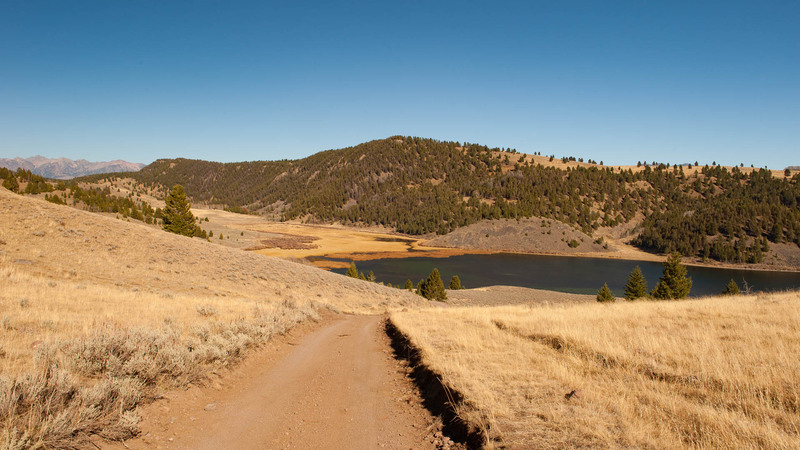 Elk lake road cuts back North, and for those sporting 2 wheel drive vehicles, be wary of the winding steep curves that more often than not have hidden potholes ready to ambush you. Continuing North for another 10 miles or so, Elk lake Road circles around the west side of Elk Lake, a beautiful narrow lake that has a small lodge offering weekend stays in quaint cabins along the banks. (Highly recommended for anyone looking to impress a spouse or significant other with a romantic hideaway). As we made the final push North from Elk Lake to Hidden Lake, the last signs of civilization began to fade and the road took its final turns to the trailhead at the southernmost point of Hidden Lake. *I would like to include to any readers or adventure seekers interested in this particular venture that bug spray is needed in the largest amounts possible with the highest deet content possible for this particular location. That being said, we doused up with spray, checked all our gear and made our way along the trail that takes a steep dip towards the edge of Hidden Lake, which at this point, was truly living up to it’s name. 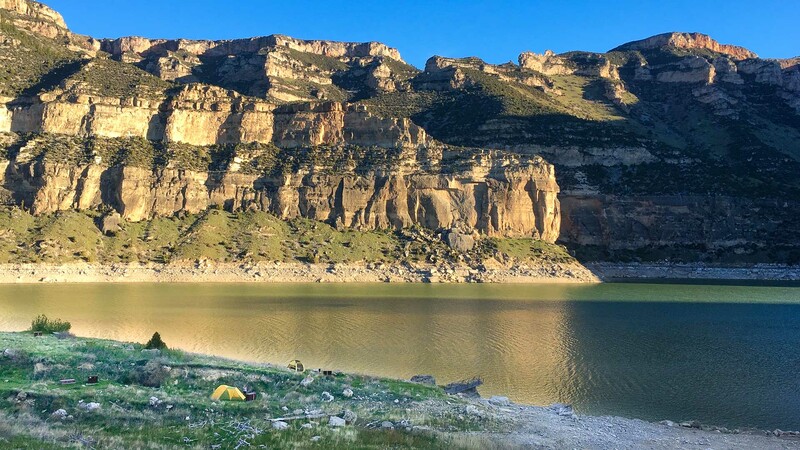 After battling swarms of determined mosquitos, we reached a small peninsula on the northwestern side of the lake, offering a view of the lake in its entirety and an excellent spot for a fire and camp for the night. After a brief scare from a passing thunderstorm, we enjoyed an evening of campfire cooking and wine drinking, dozing off to a cloudless sky and a still night. The following morning consisted of hammock rocking, leisurely casting a fly rod, and braving the icy water to cool down from the heat of the July 4th sun. For the more determined and less hungover fly fisherman, Hidden Lake is full of native cutthroat that were rolling drakes along the banks all the previous evening and morning. After lazily lounging around and soaking up some sun, we broke camp and reluctantly made our way back to the car to circle back and complete our trip. Winding back through the dirt roads and crossing back over the continental divide, we slowly made our way back east, but not before stopping at Sawtell Peak and catching an epic view of Henry’s Lake from above. A tiresome but beautiful drive ensued from West Yellowstone along the Gallatin back to Bozeman. Riding back into Bozeman, the thought of a cold shower, grilled burgers, and a sky filled with fireworks began sounding all too appealing. With two days of solid adventuring behind us, we did just that. Topping the trip off with local bison burgers, cold beers, and fireworks on top of Pete’s Hill in Bozeman truly was a remarkable way to end the 4th of July weekend. Cheers.